Authors: Mittendorff, M; Li, S; Murphy, T. E.
Abstract: One of the major difficulties in the development of optoelectronic THz modulators is finding an active material that allows for large modulation depth. Graphene is a promising candidate because in the terahertz regime it behaves as a Drude metal with conductivity that can be electrostatically tuned through the application of a gate voltage. However, the maximum absorption incurred when a terahertz signal passes through a monolayer of graphene is still only on the order of 10–20%, even for the highest practically achievable carrier concentrations. 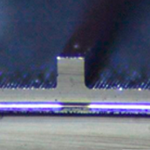 We demonstrate here a THz modulator that overcomes this fundamental limitation by incorporating a graphene sheet on the surface of a passive silicon dielectric waveguide, in which the evanescent field penetrates the graphene sheet. By applying a gate voltage to the graphene sheet, a modulation depth of up to 50% was achieved. The performance of the modulator is confirmed through electromagnetic simulations, which give further insights into the spatial structure of the guided mode and polarization dependence of the modulation. We show both theoretically and experimentally that the modulation depth can be increased to over 90% by integrating the graphene sheet at the center of the waveguide.